Arthur Dent‘s experience with his local planning department came to mind today as I tried to get hold of the documents detailing a new planning application, 12/2933/F – Permanent retention of 1x300mm diameter transmission dish. 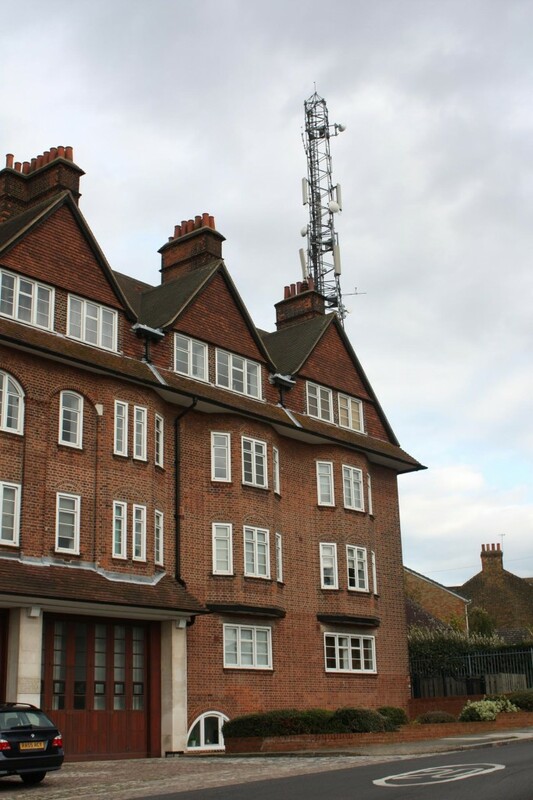 LFEPA MAST, EAGLESFIELD ROAD, PLUMSTEAD, SE18. When I first saw the application online yesterday it didn’t include any information describing what was proposed, just correspondence. I was greeted at the Woolwich Centre by a friendly man who directed me to a booth in the corner where planning documents were kept and gave me a phone number to use on the courtesy phones if the documents I needed weren’t there. They weren’t, so I dialled 5222 and spoke to another friendly, helpful council officer. We mostly spoke mostly about an old application that I was looking for, but I discovered that due to shortages of storage space the council no longer keep the paperwork for planning applications over 4 or 5 years old, which is a problem when the process takes longer as it does sometimes for significant developments. I tried the council PC in the phone booth, but it had a version of the council web site from 2012 with a non-working link to planning searches. Back to the filing cabinets where I searched through the drawers of applications, but no luck. Back upstairs and dialled 5222 again. “Ah, maybe someone up here has the file.” Which they did, and it was brought down to me in the library. I finally photocopied the documents about an hour after arriving at the Woolwich Centre. When I got home all the documents were now online! It needs to be borne in mind that the proposed development is for 1 additional temporary microwave dish which is required to be installed for use during the Olympic period. The dish will be removed by 30/09/12. So not only is the dish they promised to remove by last September, nine months ago, still there, but now they’ve changed their minds about it being temporary and want to keep it. To rub salt into the wound part of the justification for keeping this new dish in a conservation area is that “The Dish is already in situ and as such there will be no alteration to the appearance of the site.” You couldn’t make it up. The dish was originally installed to provide a back up communications link, required for security reasons during the Olympics. It provided a direct microwave link to another TETRA communications mast within 50km. The new application is also to provide a communications link, replacing their existing system based on the BT kilostream product. The application doesn’t say what the link will be communicating with, but it appears to be pointed towards London City Airport according to the maps supplied. The snippet above shows the beam directed over the old fire-station and then down Eglinton Hill. The application includes an ICNRP Declaration, which declares that the dish conforms to the International Commission on Non-Ionising Radiation Protection (ICNIRP) requirements for radio frequency (RF) public exposure: effectively declaring the design safe. As it transmits “only 50 milliwatts, approximately a thousandth of the energy of a light bulb, and 200 times lower than the energy from a mobile telephone base station”, there is less concern for safety. It is also focused in a narrow beam pointing above the roofs of nearby houses. 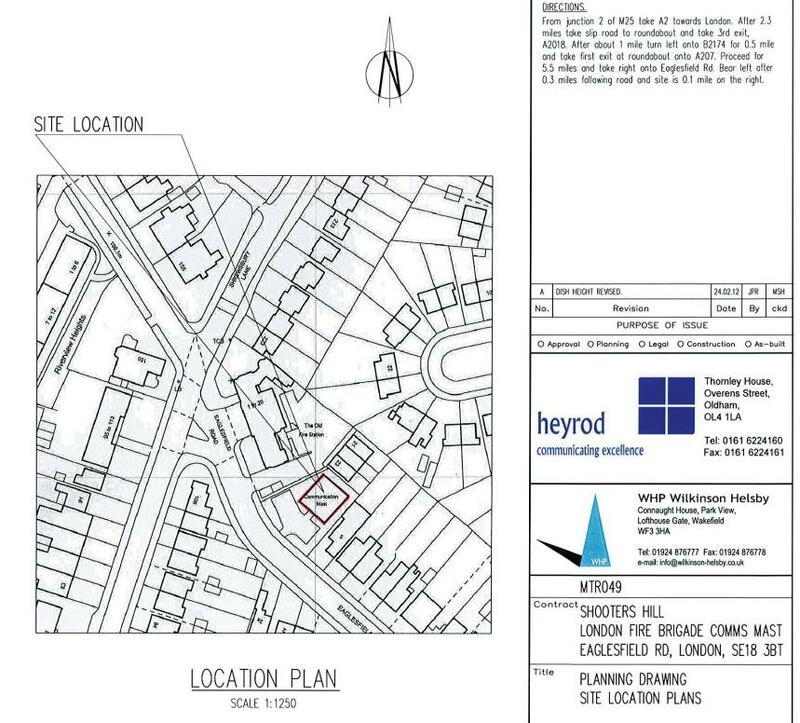 Everyone who lives near the mast, 627 addresses altogether, should get a letter inviting comments on the application. I haven’t received mine yet, I assume it’s in the post.